Lipid rafts are in every cell biology text book, but new research led by Dr. Xiaohui Zha shows that they probably don’t exist in most real cells. Originally described in the 1980s, lipid rafts were thought to be semi-rigid blocks of cholesterol, sphingolipids and proteins that floated around in the sea of membrane that surrounds cells. But lipid rafts have never been observed in real cells – only in artificial membrane models called liposomes. 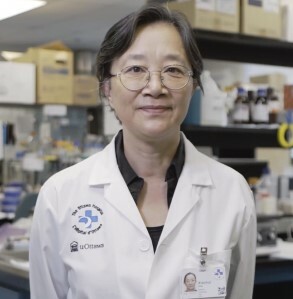 In a new paper published in Cell Reports, Dr. Zha and her team created liposomes that were much more similar to true cell membranes and showed that they didn’t have lipid rafts. They also discovered the artificial conditions that could make lipid rafts in real cells. In the real world, these conditions only exist in people with certain genetic diseases. Thus, this research will not only re-write biology textbooks, but also spur new disease-related research. “It is extremely difficult to challenge a concept that has been widely accepted as dogma for so long, but this is crucial to advance science, which is essential for the development of new treatments,” said Dr. Zha, senior scientist at The Ottawa Hospital and associate professor at the University of Ottawa. This project is a collaboration with researchers from the University of South Denmark, St. Louis University and McGill University. Authors: Courtney KC, Pezeshkian W, Raghupathy R, Zhang C, Darbyson A, Ipsen JH, Ford DA, Khandelia H, Presley JF, Zha X. Funding: Dr. Zha’s research is possible because of generous support from the community for research at The Ottawa Hospital. This study was also supported by the Natural Sciences and Engineering Research Council of Canada.